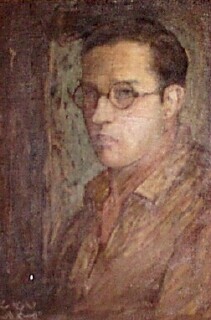 First self portrait, oil on canvas, 1925. Private collection. The muralist, painter and sculptor Jorge González Camarena (1908-1980) was born in Guadalajara, Jalisco, Mexico. He attended the Fine Arts Academy of San Carlos (“Escuela Nacional de Artes Plásticas”) in Mexico City. In 1928 headed a movement to promote Diego Rivera to be the dean of the Fine Arts Academy of San Carlos. Throughout his career González Camarena earned many coveted awards, such as “Insignia Jose Clemente Orozco” from the Congress of Jalisco State in 1956, second prize at the “Salon Annual de Pintura del INBA” sponsored by the National Institute of Fine Arts in 1962, Gold Plaque from the Government of Jalisco in 1964, “L’Ordine al Merito de la República Italiana” from the government of Italy for painting a portrait of Michael Angelo, located at the Italian artist’s house in 1967, and the National Prize of Arts in Painting in 1970. González Camarena’s works have been displayed in many exhibits, for example, at the National Museum of Plastic Arts at the Fine Arts Palace (“Palacio de Bellas Artes.”) in Mexico City and the Cntemporary Mexican Art Exhibit promoted by the Foreign Relations Secretariat and the OPIC in Burdeos, Paris, Lille, Lyon and Tolouse, France in 1958. 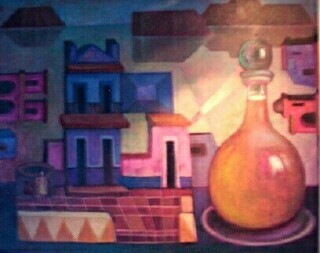 He participated in various exhibits at the National Museum of Modern Art (“Palacio de Bellas Artes.) in 1959, 1962, and 1972. Twenty Five Years of the “Salon de la Plástica Mexicana” Homenaje to the Founding Members in 1974, Retrospective Exhibit at the Modern Art Museum (“Museo de Arte Moderno”) in Chapultepec and at the Gallery “Malintzincally” in Mexico City. The artist’s murals are included in public collections such as the library at the Technological Institute of Monterrey, Mexico ("El historiador Sahagun”), Main building of the Social Security Institute in Mexico City, (“Pintura Mural”), University of Concepción, Chile (“Integracion Latinoamericana”), National Museum of Antropology in Mexico, D.F. (“Las Razas y la Cultura”), Fine Arts Palace in Mexico City (“Liberación”), Mexican Senate building (“Las Dos Revoluciones”) The Bank of Mexico, Veracruz, the Museum of Modern Art, and the National Museum of History (“Castillo de Chapultepec”) in Mexico City.